Use this break as an opportunity to reflect on your nutrition thus far. What can you do in Jan to improve your season? Try to follow the flow chart below to make sure the food you eat matches the energy you expend. When you have rest days you should in principle reduce your portion sizes, in particular, carbohydrates. If you gain fat quickly remember, unless you burn it off…you will get fat! Step 2 will cover how to stay fit over the festive period. 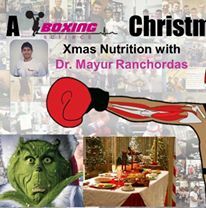 Mayur Ranchordas works at Sheffield Hallam University as a senior lecturer in Exercise Physiology and Sport Nutrition. From 2006 to 2010 Mayur also worked for the English Institute of Sport providing performance nutrition support to various Olympic and World Champions in various sports ranging from diving, winter sports, athletics, handball, and volleyball. He also has delivered performance nutrition to various professional cycling teams and Premier League Football Clubs. Mayur completed the IOC Diploma in Sport Nutrition in 2011, in 2013 became a Certified Sports Nutritionist from the International Society of Sports Nutrition and is in the final stages of completing a Professional Doctorate. Mayur represented Great Britain in the inaugural ‘Hawaiian IRON MAN Triathlon’, said to be one of the hardest endurance events in the world. Mayur will be providing some great articles for Boxing Science – Sport Nutrition, including making weight, importance of macro nutrients and supplements.